But dogs “doggie paddle,” right? Unfortunately, it is not unusual for people to take their dogs to pools, beaches or out on boats and never think twice about their safety. Maybe the fact that dogs have a swimming stroke named after them gives people the false impression that all dogs are just natural born swimmers. But that is definitely not the case. Some dogs absolutely hate the water. Other dogs may have medical or orthopedic problems that affect their strength, stamina and/or mobility making effective and potentially prolonged swimming difficult. And even if your dog does happen to be an athletic, eager and accomplished swimmer, accustomed to being in the water, that is no guarantee of safety. Injuries, confusion, hypothermia and fatigue can get the best of anyone, our dog friends included, and can result in tragedy. 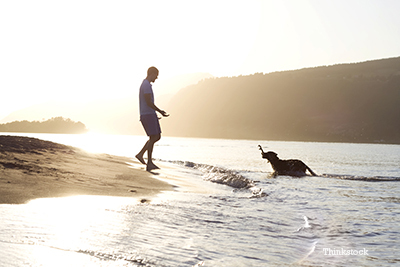 How can you protect your dog near water? One word -- Prepare. Presumably, you wouldn’t dive into the deep end of the pool or go out on a boat yourself without knowing how to swim or being protected by wearing a flotation device, right? Would you put your children at risk by not making them wear a life jacket? Remember, your dog cannot elect to take swimming lessons, or buy his own life vest, or decline the offer of a day out on the water. It is up to you to take appropriate steps to protect him. Take the opportunity to swim with your dog under supervised circumstances so that you can evaluate his personal affinity for swimming and physical ability to swim. Do not leave your dog unattended by the water any more than you would leave a child in that situation. Even if you have taken the time to “teach your dog how to get out of the pool,” remember to never leave your dog unattended. Your dog might happily jump into your pool with every intention of getting out but become injured or encumbered by objects floating in the pool and not be able to make that learned exit. If you are enjoying a day at the beach, remember that even people who know what to do if they find themselves caught up in a current or undertow or deadly riptide can still give in to panic and drown. So don’t let your dog go off and play by himself blindly trusting that he will be safe. Stay with him. If you are going to take your dog boating, get him a life vest. There are plenty of options out there for the taking. You can pick from different styles, colors and cost options. But remember, dogs come in many shapes and sizes too so be sure to take your dog with you so you know the device you choose fits properly. Then, and this is the most important part, be sure to put it on him every time. He won’t necessarily thank you. But if something happens, you’ll definitely thank yourself.